Everybody’s got an angle, sister. It boils down to this: I became interested in becoming a reporter a few years after President Richard Nixon resigned from office because undaunted by his Justice Department, two reporters--one, experienced, one, less so--Bob Woodward and Carl Bernstein--pursued what appeared to be a boring, routine story about a burglary at The Watergate Hotel in Washington, D.C., that turned out to be the use of the power of the Presidency to attempt to spy on political opponents, to 'dig up dirt,' to influence the 1972 election. Which turned out to be Richard Nixon's re-election. And related to a series of 'dirty tricks' conducted by The Committee to Re-Elect the President, or CREEP. I was impressed that The Washington Post leadership, though deeply connected, even by marriage, to the 'Washington Establishment,' not only gave its reporters time to pursue the investigation, and space in the paper for the originally very slowly developing story, under publisher Katherine Graham and editor Ben Bradley, but that they did not back down, even under essentially all the power the government had to bear on what, ultimately, was a business dependent on advertising. For those of you who may not know, Watergate actually stemmed from an earlier conflict with the press, with in fact The New York Times publication of what became known, collectively, as The Pentagon Papers. These were papers, documents, from a defense secretary commissioned study originally titled the History of U.S. Decision-making in Vietnam, 1945-1968, of the effectiveness or not of U.S. policies and procedures, (Military as well as Political) in Vietnam. It became known as 'the secret history' or 'the true history' of that police action, which began actually around the time--1954--the French government abandoned its plans to re-control its colony of Indochine, which it lost to the Japanese in WWII. It wasn't taking Vietnam back from the Japanese, as Vietnam had already kicked the Japanese occupiers out. Anyway. The main source for The Pentagon Papers, it turned out, was a former Rand and Pentagon employee named Daniel Ellsberg. 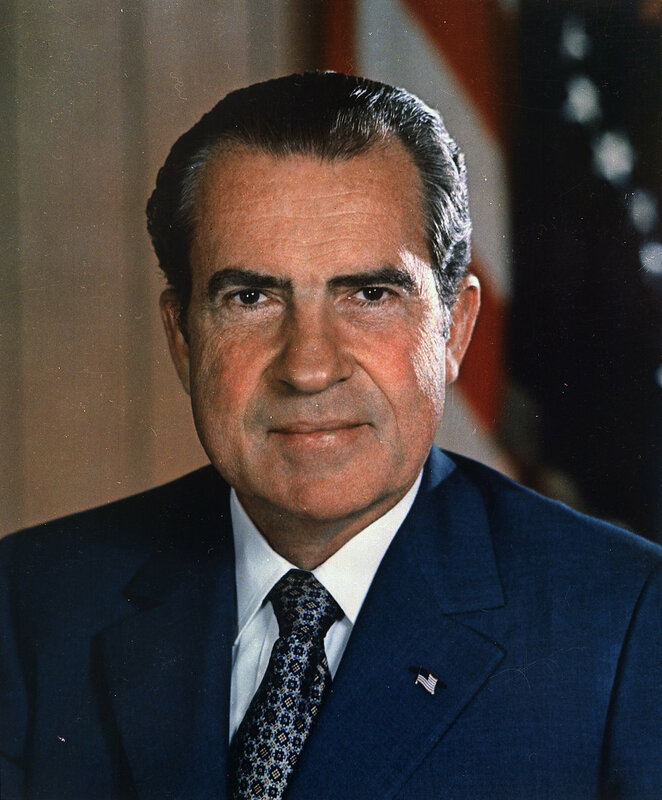 Among the 'dirty tricks' of the Nixon White House was another burglary, an attempt to break into not the Democratic National Committee's headquarters (the Watergate break-in), but an attempt to break into Daniel Ellsberg's psychiatrist's office. The U.S. government successfully ordered The New York Times to 'cease-and-desist' publication of The Pentagon Papers. And The Washington Post, the Times' chief rival in the nation's capital, which had NOT been publishing them, began publishing them where The New York Times had been forced to stop--as there was no restraining order against any other paper on the information. So. I became a reporter in the 'heady' days when reporters were proud of being not 'lapdogs' to any particular administration, but adversaries to all administrations, to all politicians, and to all causes and organizations in the interest of 'truth' for readers, or as close to it as humanly possible with the time and financial and other constraints involved. I was taught--and have taught other reporters, when I was their supervisor--you need at least two independent and corroborating sources on any purported 'fact.' A fact is defined, technically, as something that can be proven either true or false. A fact is not true by virtue of being a fact. I'll tell you when exactly I learned it: in 1981, I was covering the first murder trial of an international jewel thief and admitted serial killer named Charles Sobhraj, nicknamed 'Serpentine.' I managed to score an interview with him--the first he'd granted in six years--conducted sitting next to him in a blue police van surrounded by armed guards outside the courtroom of Judge Dinesh Narain Sharma in Varanasi, India. Among the other things I learned from the interview, Sobhraj, nicknamed 'Serpentine,' had declared he had married an American woman 'by proxy' in the jail. This was big news, considering if he were acquitted, he might be able to petition for and move to the U.S. with an American spouse. I waited for three hours at The Hotel Jaishree, sipping a pot of tea and eating a vegetable cutlet, for a trunk-line telephone connection to dictate my story to a teletype operator at The Associated Press bureau at the time on Janpath Lane in New Delhi, not having a telephone where I was staying as a University of Wisconsin language student in Varanasi. At some time in the early next morning, I got through, and dictated the story I'd written in my composition notebook while awaiting the connection. I went home, and went to bed. I spent the next day tracking down the American woman, catching her actually by telephone from The Jaishree (the nearest phone for where I was staying, the use for which I paid in cash to the desk clerk hoping for reimbursement from Kramer) at Clark's Hotel--at the time, the most expensive and luxurious hotel in Varanasi (called at the time by its British name, Benares). I actually caught her by figuring out which was the most expensive hotel in the city, and calling it blindly and asking the front desk operator for her room. And she picked up the phone. And explained amid noise and confusion in the background and other, stern voices, that she was right then in the process of being deported, and gathering her things to leave the country. Not having a lot of time, I asked her pretty much after her answering the phone: "Did you and Charles marry by proxy at the jail?" She said "yes," and I let her go. It was the only question I'd forgotten to ask, the only thing I'd forgotten to have in my 'highly readable' story. I then called the teletype operator in New Delhi again, waiting again three hours for a trunk-line connection, and noted I was dictating a paragraph of confirmation to insert in my interview with Charles Sobhraj. Which was then published by The Associated Press and picked up by newspapers worldwide. An Indian court later 'disallowed' the marriage. Obviously, I learned my lesson. But it seems to me as obvious that many--reporters, as well as readers--in this age and day of 'fake news' and urgency to be 'first' on social media, have either forgotten it, or never had to learn it. I can't tell you the number of times, at different news organizations, I've had to ask reporters if they tried to contact someone accused by someone else of something. From Brazil, to Spain, to India, to the U.S. Even when "officials" accuse someone of a crime, it isn't true--they aren't criminals, they haven't committed a crime that they're accused of--until the state meets its 'burden of proof' and a jury convicts them, or they plead guilty. It is a fact. Just one fact. The New York Times actually won against the U.S. government's attempt to stop its publication of The Pentagon Papers. The U.S. government tried to similarly 'enjoin' The Washington Post, after it picked up publication of the papers when The New York Times stopped. The Supreme Court declared that The New York Times had committed no crime, and neither had The Washington Post, and had harsh words for the government attempt at suppressing the information from the public as a clear violation of the letter and intent of The First Amendment. In libel laws in the United States, against anyone accused of 'defaming' or printing 'knowingly false' information, since the time of the trial of The Crown v. John Peter Zenger, truth has been the one solid and sure defense against the accusation. Various courts have discussed the efforts news organizations, particularly, are supposed to take to be able to defend their publication of information against such accusations. The phrase drilled into my head when covering police and crime was 'wanton and reckless disregard' for the truth. In other words, when someone--a trusted source, 'known to have been reliable in the past,' as cops term Confidential Informants--tells a reporter something, the reporter will be in trouble if he or she did not take the time to make the extra step to try and verify the information. Editors used to require some things from 'investigative reporters,' which was a term coined after many of my contemporaries started journalism as reporters, who were expected to investigate: at least one person other than the reporter or team on the story should know the identity of 'anonymous' sources, and take some effort to determine whether the information provided by that source is worth risking a reporter going to jail for refusing to name the source. There is no law that protects journalists from being sentenced for 'contempt of court' in refusing to name a source. As Judith Miller found out. In fact, even as a lowly small town police reporter, a reporter can be compelled, legally, by a grand jury to reveal an unnamed source's identity, and refusal can result in a declaration of contempt and time in jail to contemplate. In other words, journalists hell-bent on getting information from anonymous sources have to weigh the value or importance of the information, and their consideration for the safety and well-being of those sources, with their own. And the other thing is that reporters better have more than one source for their information, in any story that purports to be "news." Analysis, or opinion, like this post, are different. But 'real news' is defined by editors as information from at least two independent, corroborating sources. In fact, that's a way you, the reader, can spot 'fake news' every damn time: if there is only one source cited, or no source cited. It's not just 'he said, she said' information gathering. It's an attempt to gather the truth, not a slant, not a particular angle, not a 'spin,' but the truth, of any situation, event, report or rumor. I'll tell you another story. Not long after I started in New York, I was a reporter covering energy markets for what was then known as the International Petroleum Report, an energy newswire operated by AP-Dow Jones News Services, a joint venture between The Associated Press and Dow Jones Newswires that hired me from South Carolina's The Island Packet. A rival newswire, which has changed so much since 1993 anyway it isn't even worth mentioning, though it was important at the time, and outnumbered even members of our Petroleum Report by 4-to-1, seemed to have a habit of sending headlines, they called "snaps," the minute they got wind of anything that might affect oil or natural gas prices. So, part of my job, or one of my jobs, on the Petroleum Report was to track down and either corroborate, or 'knock down' the rival service's headline. We on the IPR referred to it as 'rumor patrol.' I only began to enjoy rumor patrol duty when I was talking to one of my own sources in the energy industry and we were discussing how I spent much of my time trying to catch up to the rival service's 'news.' My source told me to stop worrying about being 'first,' which even before the internet was the two watchwords for any newswire service. He said that was the rival newswire's problem. They were frequently first. But known to be more concerned with being first than being accurate. He told me experienced traders on the floor of The New York Mercantile Exchange actually watched whenever they saw a headline cross their 'green board' on the floor of the exchange from the rival, and waited to see the Dow Jones IPR headline following it before reacting. Because we were trusted above our rivals, not to be first. But to be right. To be first, but accurate, became the watchword for me, and reporters that reported to me, and others on AP-Dow Jones. It does seem to me that being first on the internet, and on social media, particularly, as well as television, to attract advertising dollars, has replaced being accurate, as well as fair, and guarding against wanton and reckless disregard for the truth, if not actually true. There is, as every reporter knows, a difference between truth and accuracy, by the way. Truth is actually harder to define, and print. Accuracy--verifiable, provable attempts to locate truth--is the most that can be hoped for.